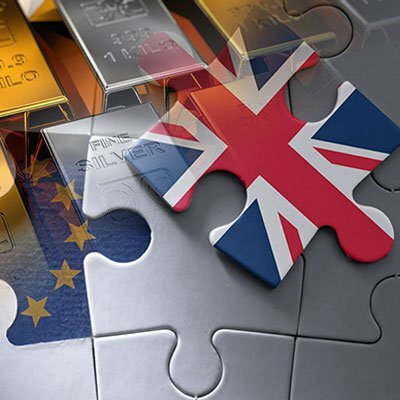 Brexit Aftermath: What Now for Gold and Silver? British voters rocked financial markets overnight Thursday and throughout Friday by deciding to exit the European Union. Few expected the outcome as polling and odds-makers both got it wrong. Now traders, most of whom were positioned exactly wrong, are wondering what the fallout will be in the days ahead. Many are rushing to safety. The U.S. dollar was up sharply in Friday’s trading, and Treasury yields plummeted as investors bid strongly for them. But gold outperformed both. It gained nearly 5% in one of its biggest daily moves ever and ended at a 27-month high. Silver rose nearly 3%. Meanwhile, stock markets everywhere got clobbered, commodities fell, and currency markets are in turmoil. We should learn something this week about just how wrongfooted the trading houses on Wall Street and around the world were when the votes were finally tallied in the UK. Margin calls are going out and trading losses have the potential to crush firms, many of whom are highly leveraged. Nassim Taleb developed the theory of “black swan” events to describe happenings that are unusual and hard to predict, but that shake the world when they occur. A black swan may have just landed in Europe. Brexit Vote Shocks the World – So Now What for Gold & Silver? Metals investors should buckle up for the next couple of weeks as they await the verdict on just how momentous the British referendum will be in the markets. Here as U.S. markets re-open on Monday there are simply too many unknowns. On one hand, the referendum is just the first step in a process likely to take years. One can imagine very little long term significance as markets simply adapt to a United Kingdom that is more independent, but remains quite engaged and happy to trade. On the other hand, world financial markets are highly leveraged and massively interconnected. The collapse of even one bank or hedge fund can have vast implications. We saw that when Lehman Brothers collapsed in 2008, and before that when Long Term Capital Management failed in 1998. Gold and silver working as intended. As mentioned above, gold outperformed the U.S. dollar and Treasuries as the go-to safe haven asset. Investors rushing around on Friday and looking for somewhere to flee favored the yellow metal. That hasn’t always been the case. During the 2008 financial crisis, it took weeks for investors to come around. The instinct then was to buy dollars and Treasuries first, then metals. Maybe today more investors question just how much safety the U.S. dollar and debt really represent. If the current turmoil should deepen into a broader crisis, we can look for more investors to run the same calculus and arrive at the same answer: buy gold. Should markets quiet down, we may see some selling as traders redeploy back into risk assets. In either case, Friday’s action helped reaffirm metals as the ultimate anti-paper asset. The world may be about to get another lesson on who central bankers actually work for. Central bankers talk a lot about maintaining their independence. Too bad for them, but people are starting to figure out exactly what “independence” means. While they are completely unaccountable to you and me, they certainly do answer to another power. 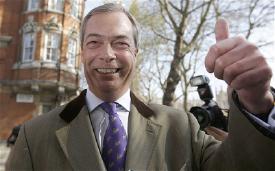 Nigel Farage and his victorious UK Independence Party (UKIP) made a lot of hay by revealing just what a rotten deal average citizens are getting from the world’s largest banks, the financial markets they dominate, and the central banks they own. During the 2008 financial crisis voters had no choice but to watch as officials ignored their angry phone calls and went right ahead with wildly unpopular bank bailouts. Central banks printed up hundreds of billions and handed it out – rewarding, rather than punishing firms for making bad bets and committing wide-scale fraud. They followed it up with programs in which banks got top dollar selling their worst garbage loans, in bulk, for more freshly printed cash. Rotten monetary policy was sold as stimulus for the economy. But after years of poor results, that attempted justification is now wearing a little thin. People all through the first world can see the financial sector dominating ever larger portions of the economy, even as broader wages and employment lag. We may or may not see banks and officials once again collaborating to stick their Brexit losses with the citizens. It will depend on just how bad the losses are. However, no one should completely discount the possibility of another “Lehman moment.” Remember the terms “systemic risk” and “too big to fail”? The share prices of some major banks, including Credit Suisse and Deutsche Bank (both of which are larger than Lehman), indicate real trouble is brewing. DB shares cratered 17.5% Friday and trade below their 2008 crisis lows. Central bankers are already riding to the rescue with promises to provide whatever “liquidity” is needed to banks. Speculation is the Federal Reserve will postpone more rate hikes, or forgo them altogether. Just prior to the referendum, Janet Yellen, told Congress the Fed has authority to impose negative interest rates. But she assured representatives there are no plans to implement that policy at the current time. Well, a lot can happen in just a couple days! We suggest savers and pensioners buckle up. They may not think it can get worse, but it can. In any event, these are exactly the kind of developments which ought to undermine fiat currencies and government debt, and fuel a preference for gold. So far, so good. Those of us who consider central banks as the problem will look for more flight to precious metals in the days ahead.